There will be no Sunbus services on Queensland’s Sunshine Coast today after a four hour strike turned into a 24 hour shutdown with buses back in operation from 4am on Saturday. 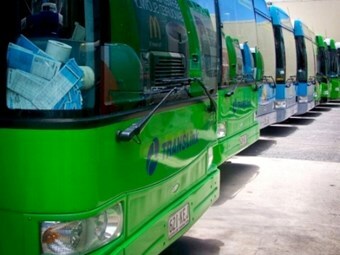 Transit Australia Group’s Strategic Planning and Delivery General Manager Megan Harkin says Sunbus decided to suspend services for 24 hours after the Transport Workers Union placed a ban on driver overtime. Sunbus received notification on Tuesday afternoon that there would be a four hour stoppage today from 4am to 8am. "But further to that the TWU placed a 24 hour ban on overtime for Sunshine Coast driver members," Harkin says. "In practical terms it means 30 percent of the shifts can’t be delivered so we couldn’t guarantee a timetable – we had to shut down for the entire day." Harkin says a ban on overtime means drivers cannot work to cover extra shifts should a rostered driver fail to turn up to work, due to illness or other factors. "Sunbus is both contractually and morally committed to delivering 100 per cent of scheduled services," she says. "Our duty of care is to protect all passengers all of the time, a fact the TWU seem to have forgotten." Harkin says TAG has continued to negotiate with the TWU over the enterprise agreement that expired on June 30. "We met with senior members of the TWU two weeks ago and explained that the offer we have on the table is absolutely final – there’s no more to give," she says. TAG has offered over three years back paid from July 1 2010 a 4 percent increase for the first year, 3.5 percent for 2011-12 and 3.5 percent for 2012-13, with an increase in penalty rates on weekends. The 2010-11 increase will be back paid if the offer is accepted by the TWU. The wage increase component totals more than 11.4 percent over three years from July 1, 2010. "This offer when rolled up equates to a pay increase of over 13.4 percent, which for most Australian workers would be more than acceptable," Harkin says. Harkin says TAG is waiting to see what comes of this morning’s stoppage and the 24 hour shut down. The TWU has announced there will be demonstrations outside TransLink’s head office in Brisbane on the first day of each month leading up to the Queensland election. "It’s not really a Sunbus issue – it’s an industry-wide issue," Harkin says. "Initially we had set out to revert to the Federal Award (The Passenger Vehicle Transportation Award) and that was completely unacceptable to the TWU. "The TWU were at the table in Canberra when it was all agreed that we would move to the Federal Award, but that’s not what we are now hearing from the TWU on the Sunshine Coast." Transit Australia Group’s Sunbus services will be back on the road at 4am tomorrow morning.